A couple of months ago Michael Dalton Johnson contacted me through my contact form and asked me if I knew of anywhere he could find a list of the top marketing blogs online. In a couple of minutes, I had the list he was looking for back to him. Just had to do a quick search through my bookmarks and do a quick Google to make sure I had the most current link. It seems that everyone wants to build a list and then not update it. I’m not one to speak, because a few of mine are pretty old. But I got the link back to him. And he was writing a book called Rules of the Hunt. So he asked for my mailing address and I was just moving into my apartment/office in Kansas City. It’s an office most of the time and an apartment when I need it to be. So I completely forgot about after I had settled into the place and then two weeks ago, there was a package at my door. I don’t get any mail here, so it surprised me and there was my book. And each short piece packs a punch and stands alone by itself, so it’s a book you can read all the way through or open a page and start reading. No strict set of rules to follow. No 38 steps to business success. Just some extended common sense, as I would like to call it. 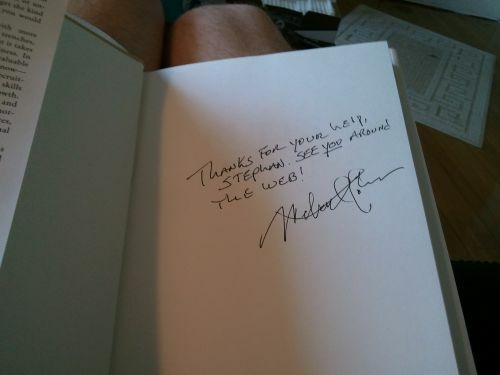 Thanks for the book Michael!